Definition: The Delegation of Authority is a process through which a manager assigns responsibility to the subordinate to carry out the work on his behalf. Also, a certain authority is delegated to the subordinate to the extent, which is sufficient to accomplish the assigned responsibility. Principle of Functional Definition: An organization is comprised of different functional departments, each contributing to the organizational goals and, in turn, have their specific objectives.Thus, clearly defined objectives of each department, the expected results, the specific activities to be performed and intradepartmental relationships help the manager to determine the requirements of that specific position. Principle of Result Expected: Before actually delegating the authority to the subordinate, the manager must know the purpose of such delegation and the results expected from it. The goals, targets and the standard of performance must be clearly defined to direct the actions of the subordinate towards the accomplishment of a given task in a required manner. This principle helps in determining the authority to be delegated which is sufficient for completing the responsibility. Principle of Partity of Authority and Responsibility: This principle states that the responsibility and the authority co-exists. This means, if the subordinate is assigned certain responsibility, he must be given some level of authority i.e. power to perform his responsibility.Thus, both the responsibility and the authority shall be clearly defined to the subordinate, so that he knows what he is required to do within the powers delegated to him. Principle of Unity of Command: According to this principle, every subordinate should have a single supervisor from whom he gets the authority and to whom he is solely accountable. This means the subordinate should get the instructions from a single superior and perform those responsibilities as assigned by him. In case, if the subordinate is required to report to more than one boss, then there may be a conflict and delay in the managerial operations. Principle of Absoluteness of Responsibility: This principle asserts that responsibility cannot be delegated. This means even after delegating the authority to the subordinate to perform certain tasks on the manager’s behalf; the manager will be solely responsible for the doings of the subordinate. In other words, whatever actions being taken by the subordinate, the manager will be accountable to his senior. Thus, the responsibility is absolute and remains with the superior. 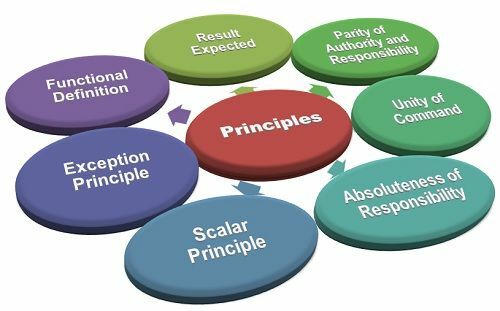 The Scalar Principle: There are clear lines of authority in the organization, i.e. who is under whom. This helps the subordinate to know, who delegates the authority to him and to whom he shall be accountable. Also to whom he shall contact in case things are beyond his control. Thus, this principle asserts, that there should be a proper hierarchy in the organization. Principle of Exception: According to this principle, the subordinate shall be given complete freedom to perform his responsibilities under the purview of his authority. The manager should not interfere in between his work and must allow him to do even if he commits mistakes. But in some exceptional cases, the managers can interfere and even withdraw the authority delegated to the subordinate. Thus, a manager must comply with all these principles of delegation of authority to ensure that the task is accomplished in a manner it was intended.